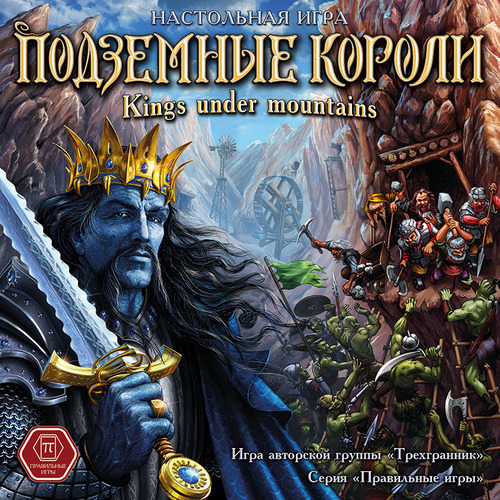 Kings Under Mountains is a game by Anatoliy Shklyarov, Alexey Konnov and Alexey Paltsev published by Rightgames. It is for 2-4 players. In this game, players are the rulers of one of four fantasy races. During the course of the game they will use the other 3 races to obtain mines and develop them in order to score victory points. To begin, the 4 king cards are shuffled face down and each player chooses one, placing it face up in front of him. This is that players race. The rest of the cards are shuffled with the top four cards played mine side face up on the table. These are the starting mines that the players will be competing for. The next four cards are played race side face up with the same race being played on top of each other. This is the mining camp that players will be able to draft workers from later on. Lastly, each player is dealt 6 cards and play can now begin. On a player’s turn he can perform one of two actions. He can play a race card other than his own race on a mine in the center of the table, or he can play a race card on one of his already captured mines. Each mine card has a mine size, mine defense and value in victory points. To capture a mine players will play a card from their hand to one of the mines in ascending order. In other words, if another player has played a 3, then a card of 4 or higher has to be played on it. Players will continue playing race cards until the defense of the mine has been met. The last person to play a race card on it will acquire that particular mine. Mines vary in cost so it’s all a matter of knowing when to play a card on it. That’s only the first part though, as players will need to develop the mine before being able to score points. To develop a mine, players will need to play race cards from their hand to meet the mine’s size. If there is an overseer icon on the mine, they will have to play a race card of their kings to be able to score that particular mine. Once a mine is developed, the scoring mine cards go underneath the players king and will be added up at the end of the game. Any undeveloped mines at the end will be subtracted from his points. So it makes sense to keep an eye on the deck as well as not acquiring too many mines at one time. Players will continue to go back and forth playing a race card from their hand. Each time they do, they will draw a new card from the deck or they can draw the top card from any pile in the mining camp. This allows him to get race cards of his kings if he’s not able to draw them from the deck. When the last card in the mine deck is depleted, the game is over. Therefore, if a player is constantly drawing from the mine deck the game will end a lot quicker. Once all the mine deck has been depleted, scoring begins with players adding up the point value of each completed mine and subtracting the undeveloped mines points from them. The player with the most points wins. The only components to this game are some beautifully artistic double sided cards. I think the artwork is great and each race looks amazing. The opposite side shows the mines which look like any fantasy mine should. There is a real feel of beauty to each card. They’re a little thin but still feel strong enough for lots of play. The rulebook for this game is a small double sided poster. In my copy there were two posters, one with English rules and one with German. The rules are very straight forward and easy to understand. It didn’t take long to read and I was ready to play. 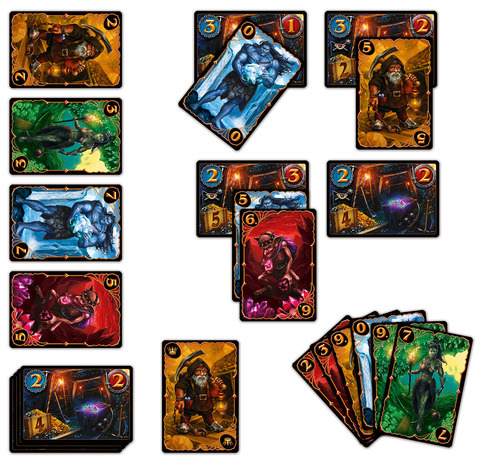 There are pictures to help players understand the mine card icons as well as understanding the capturing and developing aspects of the game as well. This game can either be very fast or really slow, depending on how players play. If players constantly are going for the mine deck, the game will rush by. Likewise if players are only drawing cards from the mine camps, it will take forever. Thankfully when we played, we did a little of each. That made the game play just right. It’s really simple and quite fun. The theme feels rather good as well. It felt as if I was a king enslaving other races to do my bidding. Unfortunately for me though, the goblins were just not strong enough to win, falling to the orcs instead. All in all, I really enjoyed the game. Kings under Mountains is a very light game of hand management. It’s seems to me that this is a great filler game or warm up for more intense games. I enjoyed how easy it was to play and how fast it could be played. All in all, if you’re looking for a game with great artwork that’s fast and easy to play, this might be the game for you. I enjoyed it. For more information, please check out RightGames at their site. This entry was posted in Reviews and tagged board, board games, card, card games, games, kings, kings under mountains, mountains, rightgames, under. Bookmark the permalink.